For a woman to emerge as the first exponent in any field, especially in highly traditional and patriarchal society like ours, requires great courage. And more than courage, extreme dedication and steadfastness to be able to break all existing norms, if required. This is why such women continue to be extolled in the highest terms. Khumanthem Ningol Nameirakpam Ongbi Ibemni Devi is one such woman whose extreme dedication and hard work have garnered her much recognition not only in the State, but in other parts of the country too. Nameirakpam Ibemni was born in July 1926 in a highly illustrious family at Wangkhei Ningthempukhri Mapal. Her father was the renowned late Khumanthem Chaoba Singh, a pioneer of Khongjom Parba. 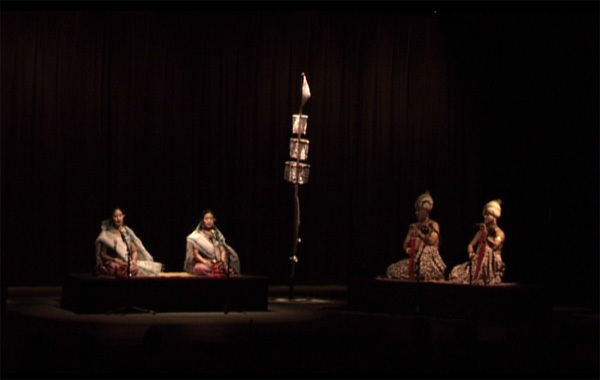 Her mother, late Kshetrimayum ningol Keina Devi also used to participate in traditional singing before her marriage. Her maternal grandfather too was a famous wari leeba artiste. As such, the artistic blood running in Guru Ibemni’s veins wasn’t to go to waste even though she lost her father when she turned seven years. She was just six years old when she started learning Nata Sangeet from the late Guru Yumnam Natum Singh, the pioneer of contemporary Nata Sangeet. She also went on to learn various forms of traditional singing such as Monoharshai, Bashok, Khunung Esei, Holi, etc, besides taking part in various traditional opera forms such as Gostha, Udukhan, Nouka, San Senba, Vilas, Moirang Parba and Maan Bhanjan. “I was the first woman to join the Moirang Parba. I was about 13 years old when I played Thoibi, before that only men used to play female roles too. I attracted quite a lot of fan following due to the role. On the roads, people would say, ‘There goes Thoibi Sabi.’ But there were also many who would ridicule me openly saying why she takes part in Moirang Parba among all the males. This hurt me and I left after about six months,” Ibemni recalls. “The former king, His Royal Highness Maharaj Okendrajit’s mother Sangai and I were friends. One day some of us girls had gathered at her house and in jest I said I can sing Khongjom Praba. So we dragged out a big dholak from her house and I sang a composition by my maternal uncle. In reality, I had never learnt Khongjom Praba and the song I sang wasn’t Khongjom Praba per se, but meant to be sung in accompaniment to Thabal Chongba. But we were young and my friends loved it. Later His Royal Highness Maharaj Budhachandra called for me and asked me to sing the song again. It seemed Sangai had told him about my singing. I was terrified. How could I sing something that I do not know? I tried to run away with my mother saying that Sangai must have lied. But His Excellency was very generous. He advised me that I should learn my father’s legacy and keep it alive. He also blessed me that I should become a great Khongjom Praba singer. After that both my mother and maternal uncle also encouraged me. At that time I was trying to shake off the infamy of playing Thoibi in Moirang Praba. So after some persuasion I agreed and that was the start of my story,” she recalled. “People loved my singing and I was invited everywhere, many times by His Royal Highness Maharaj Budhachandra too. In those days I was young and immature, and as they say, the fool do not fear a tiger, I didn’t realize what I should fear. Sometimes I would stop singing midway saying that I had memorized until that part, and His Royal Highness would excuse me. Such was his generosity and patronage,” she reminisced nostalgically. Guru Ibemni got married to late Nameirakpam Achou Singh at the age of sixteen years. “Both my in-laws loved my singing and encouraged me, but my husband had his reservations. However I was adamant and would go to my Guru’s house with a child on my back early in the morning after finishing all my household work. Ultimately after much tension, he came to understand my passion and started engaging teachers to come to our house to tutor me,” she said. This dedication has helped her to become a well-known balladeer and also master many art forms of Manipur. She learnt the khol and became the first female Mridanga player of Manipur in Choir Singing. She learnt the dholak and also established the first female Holi pala group in which a female dholak player was introduced. In her specialization field of Khongjom Parba, she learnt Govinda Nirupa, history of Manipur, Moirang legends, Jila Darbar of Maharaj Chandrakirti and other historical ballads and Ramayana epic. In his distinctive way, she also gave much to the arena from where she gained recognition. She introduced in Khongjom Parba various styles and forms such as Mahabharata, Kurukshetra or Pravas Milan, Shrivatsa Chinta, besides composing more than 150 short ballads for All India radio, Doordarshan and other special events. She also introduced ballads about Mahatma Gandhi, Pandit Jawaharlal Nehru, Netaji Subash Chandra Bose, Hijam Irabot and the Twenty Point programme of Indira Gandhi. She established a Khongjom Praba School in 1964 at her own house, besides establishing a holi choir group in 1964 and a woman choir group in 1972. She has produced more than 50 students in Manipur, Tripura, Assam and Sylhet. For her work, Guru Ibemni has received many grants and awards including the Joy Patra for holi singing from the Manipur Royal Palace in 1964, the Manipur State Kala Akademi award in 1989, Certificate of Honour conferred by the state level committee of Republic Day celebration of Manipur in 1991, Sangeet Natak Akademi warad in 2004 and the Sangeet Ratna 2005 of the Manipur Sahitya Parishad. She also featured among the ten outstanding artistes of the All India Radio, Imphal in 1998. Guru Ibemni lives in Kwakeithel Soibam Leikai. She has eight children – three daughters and five sons.